Figure 1. Statue of Freedom Medal, gold in color and measuring 71 mm (2.8 inches) in diameter. 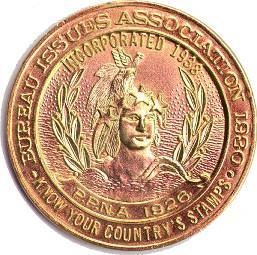 The USSS Gold Statue of Freedom Medal is sent automatically to all APS World Series of Philately shows. The USSS Silver President’s Award medal is available upon request to all local and regional shows.